The Belcar winning GLPK Corvette C5-R, chassis number 11, is for sale (see Headlines item immediately below this one). 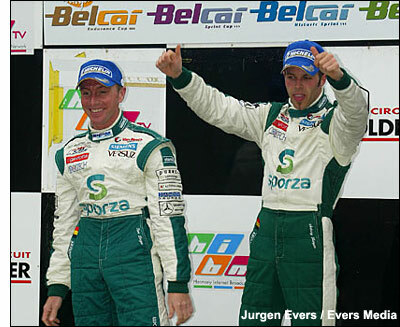 This car won two FIA GT races in 2005 and five Belcar Original races in 2006 with Kumpen and Longin driving (on the top of the podium in this image). “But next year, GT1s disappear from the Belcar scene,” explains Bert Longin. “So we’ll have to look out for something else. As Belcar rules aren’t definitive yet, we don’t know what, but it might be a GT3 Viper or Corvette, or even a GT2 Mosler. “Anyway our C5-R has to be sold: it’s a pity as I like the car very much. It’s one of the best I’ve ever driven and I think it’s a potential winner in LMS or FFSA GT, but a privateer could run it also in the ALMS. Link to the classifieds page.